friends and family. Below, we’ve listed a handful of the best spots to enjoy a meal in the great outdoors, without straying too far from home. 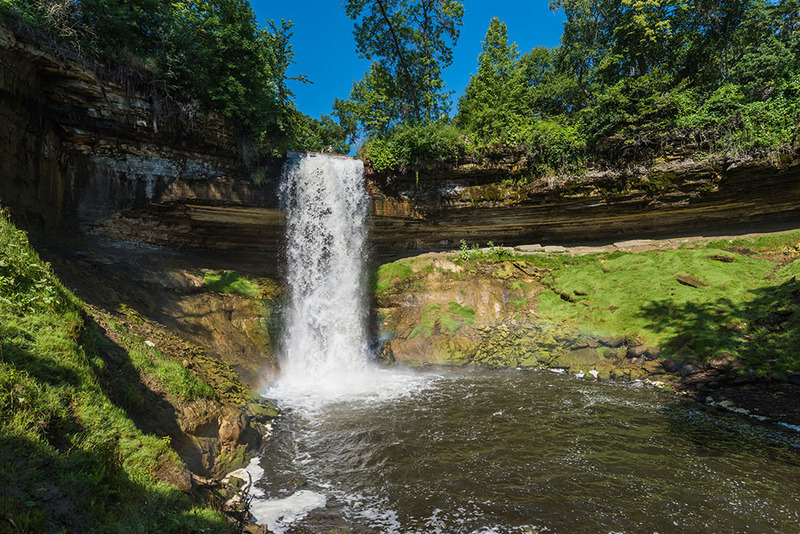 A quintessential Minnesota experience, Minnehaha Falls is the perfect picnicking destination. Not only do they have ample picnic table and grilling stations throughout the upper park area, but you can stroll the trail at the base of the falls all the way to the Mississippi River if you’re so inclined. For those who’d rather dine than picnic, the seasonal Sea Salt Eatery just adjacent to the Falls offers a delicious variety of fresh fish options. Located along the mighty Mississippi off River Road in St. Paul, this tucked away gem offers multiple covered and open picnic areas. Stroll along the river’s edge and the boat launch, or explore a number of scenic trails that lead to, you guessed it, a beautiful hidden water fall. Stop off in nearby Highland Park afterwards, for frozen yogurt or to browse a variety of cute shops and boutiques. A popular spot with sweeping views of the downtown Minneapolis skyline and the Mississippi River, Boom Island Park offers both covered and exposed picnic areas. Grill out, then take a serene stroll along the waterfront path and watch the boats drift by. Just a hop, skip, and a jump to the Stone Arch Bridge, and Northeast Minneapolis, there is plenty to do and see in the area. One of the most active outdoor spots in the Twin Cities, Bde Make Ska (formerly known as Lake Calhoun) is a fun, scenic destination with plenty of great places to picnic. Bring your suit and hit the beach, walk or bike the perimeter of the lake, or rent a number of different watercrafts for the complete experience.